House Republicans Accuse Dems of Sabotaging Bipartisan BillsPelosi’s caucus is allegedly denying vulnerable GOP moderates the opportunity to support bipartisan bills. Let’s hope that’s true. House Democratic Establishment Declares War on DemocracyThe DCCC just announced that it will blacklist any campaign vendor that works on a primary challenge to a Democratic incumbent. Pelosi, AOC Warn Moderate Democrats to Stop Voting With the GOPThe spat over gun-vote defections shows Pelosi may have to choose between imposing party discipline on moderates, or moving fewer “messaging” bills. GOP Warns That Releasing Trump’s Taxes Could Lead to Further TransparencyRepublicans say exposing Trump’s conflicts of interest is a slippery slope that would lead to exposing all politicians’ conflicts of interest. Republican Solidarity Will Protect Trump From ImpeachmentHistory shows that impeachment efforts tend to tighten the bonds between president and party. With Trump’s party controlling the Senate, that’s big. House Democrats Aim to Make Voting Rights a National PriorityTheir bill isn’t an immediate fix, but treating voting as a national issue rather than a state-level problem could pay dividends down the road. Democrats Are Fighting About Whether Deficits Matter. That’s Good.For decades, the Democratic Party was united in its reverence for balanced budgets. Now, that (regressive) consensus is dead. Congress On Track to Put Off Spending Fight Until FebruaryThere’s a chance a spending deal can still be reached, but more likely, talks will drag on into 2019 — but with no government shutdown. Democrat On Why He Voted for Yemen War: ‘I Don’t Know a Damn Thing About It’Collin Peterson believes that America should have a global empire — but American congressmen shouldn’t have to keep up with international news. Pelosi Clinches Speakership With Term-Limit AgreementShe’ll be out of leadership by 2022. Pelosi May Accept 4-Year Term Limit on SpeakershipIt’s mainly a face-saving measure for anti-Pelosi rebels who, at most, can keep her from serving as House Democratic leader well into her 80s. Pelosi’s Future in Doubt as House Dem Dissidents Go Public in OppositionAnti-Pelosi House Democrats are close to the numbers needed to force her to step down, but aren’t there yet, and don’t have their own candidate. House GOP Passes ‘ICE Is Nice’ ResolutionHaving failed to get House Democrats to vote on a progressive “abolish ICE” bill, House GOP settles for an empty messaging resolution. Ryan Offers to ‘Fix’ Family Separations on Border in His Doomed Immigration BillSince Ryan can’t actually enact immigration legislation, he might as well use it to offer cover to Trump on the nasty situation on the border. Could Nancy Pelosi Lose Her Leadership Position After the Midterms?If Democrats retake the House, Pelosi may need to keep Democratic defections at a minimum. If Democrats fall short, anything could happen. What Needs to Happen in Congress Today to Avoid Another Government ShutdownThere will be loud dissents today, especially from House conservatives and Democrats — but it looks like the spending deal may get ratified. Darrell Issa Becomes 30th Republican to Announce RetirementThe Democrats’ chances of taking the House have improved significantly in the last 48 hours. 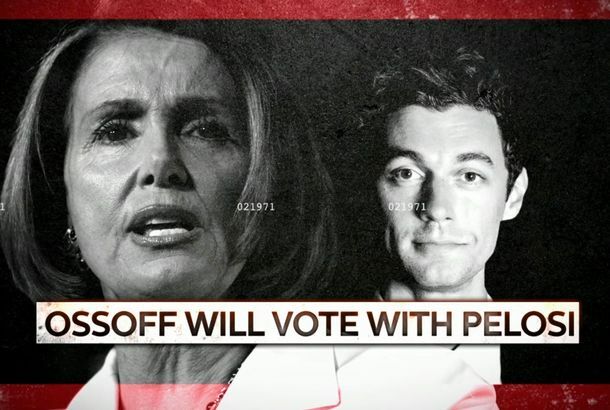 Nancy Pelosi Didn’t Cost Jon Ossoff the ElectionThe Democrats aren’t going to take back the House by winning voters who recoil at the thought of a liberal woman from San Francisco holding power. Pelosi Promises to Pass $15 Minimum Wage If Dems Take HouseDon’t look now, but Capitol Hill Democrats seem to be putting together an ambitious, populist post-2016 agenda. House Democrats Threaten Shutdown If GOP Votes on Zombie TrumpcareAs the House nears an agreement on a one-week spending bill, Democrats warn that a new Trumpcare vote would be a deal-breaker. Comey Won’t Tell House Dems Whether the FBI Is Investigating Trump’s Russia TiesAfter publicly commenting on the FBI’s Clinton investigation before the election, Comey won’t privately discuss its intelligence on Trump.